Death of Daredevil title should get comic fans notice but if not you should notice that wrting is the series is the hot shot writer Charles Soule who is ending his run with this story arc and Marvel has called artistic big gun Phil Noto for the story as well. 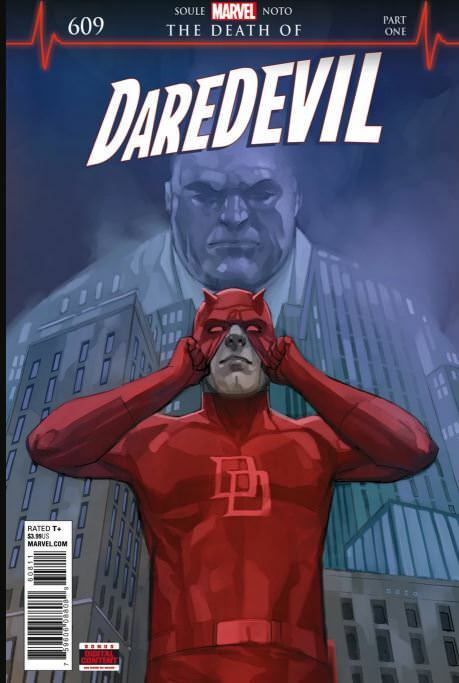 I do not know too much more about the series but the artwork for it has featured longtime Daredevil nemesis the Kingpin. This series shold also tie into very well with the upcoming Daredevil Season 3 which will also feature a struggle between Daredevil and the Kingpin. Charles Soule is going to write the final Daredevil series in his arc with Daredevil #612 which will effectively end his run. The last issues in his arc are going to be called "Death of Daredevil". Charles Soule does not want a writer to pick up Daredevil in an easy spot, instead he wants them to pick up in an impossibly hard one.